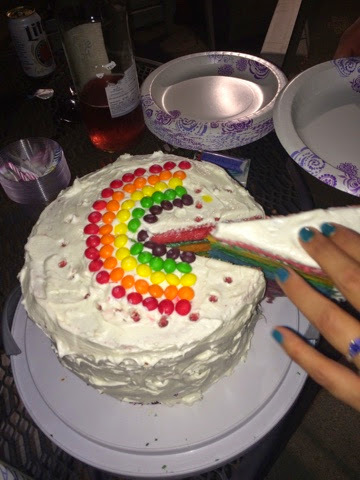 On saturday, we celebrated my bestest friend Gina's 30th birthday! 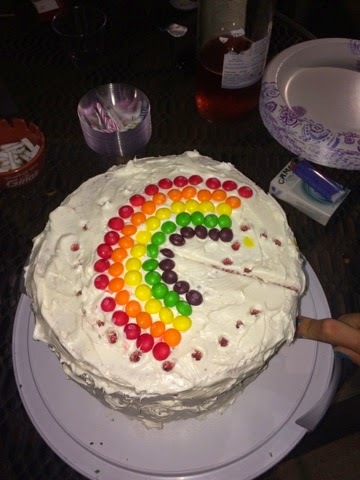 I knew that I wanted to make her an epic cake. 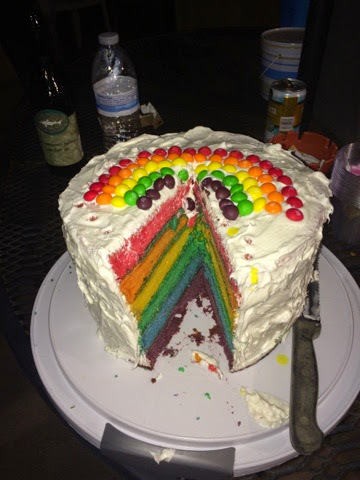 I also knew that I wanted it to be RAINBOW! I set my sites on pinterest and found TONS of tutorials. 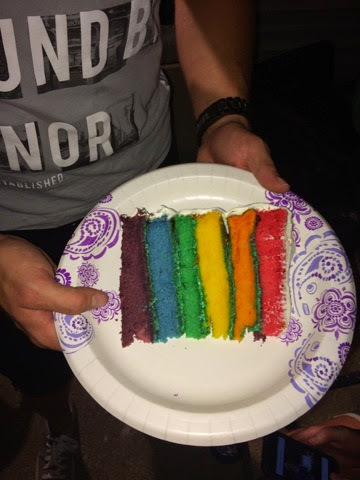 I also found a lot of skepticism regarding rainbow cakes. Saying most pictures were photoshopped and your cake would not turn out like theirs. IT DIDN'T MATTER! I was on a mission. 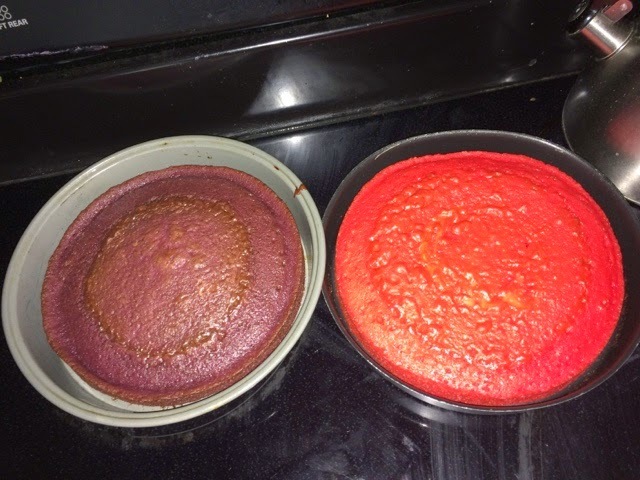 I set out making my cakes. I used 3 cakes (Betty Crocker White Cake). I mixed up the first and divided into two equal parts. 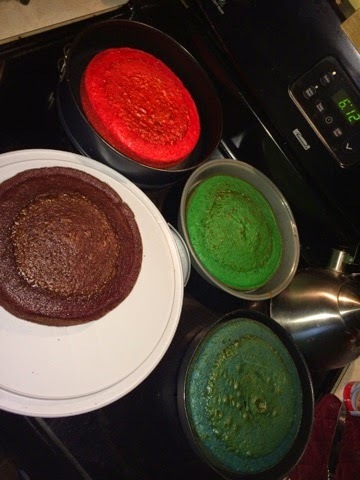 I added food coloring and baked. I repeated that process two more times to get all six layers! anyway, once everything was cool I began to stack the cakes. I put a very thin layer of green icing in between the layers to hold everything together. I did one layer of icing all over and put in the fridge for about an hour. The icing hardened up and I was able to do another layer to make it a tad nicer looking! 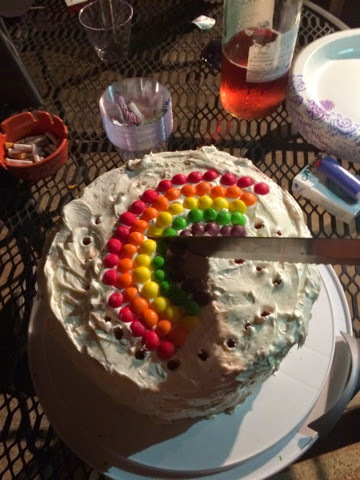 I added the skittles into a rainbow for fun! I was SO nervous when she began to cut into it. I just knew the cakes were going to be ugly! I don't always toot my own horn but for a cake like this, it has to be done. 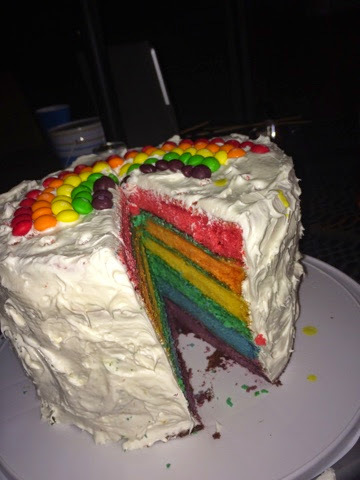 If I can make this cake - seriously, anyone can! And it's perfect for any occasion, for any person!